In 1 John 3:16-18 we see that Jesus showed us love by laying down His life for us, and that we ought also to lay down our lives for our brothers and sisters in need. We also se that it is not enough to give verbal assent to this truth, we need to put it into action. In 2 Corinthians 8:9-15 we see another example. In this one we see that Jesus made Himself poor that we might become rich. And Paul then applies Jesus’ example to the Corinthian Church, a congregation that was experiencing a time of great abundance, and encouraging them to share their abundance with the poorer Church at Macedonia. I would like to close with a reiteration of John’s admonition to act in deed and in truth by sharing a passage from James. In chapter 2 verses 14-17, James shows again how our faith must be more than just verbal assent, it must play out in action as well. And James gives another example of a brother or sister in need, and how we, as followers of Jesus, must not simply say that we will pray for that brother or sister, but must also do a concrete action to help alleviate the situation. It may seem obvious, but following Jesus is more than knowing what Jesus said, it is doing what Jesus does. May peace go with you. I am in total agreement with your writing here John. Today, many people are using the excuse of others being their example. 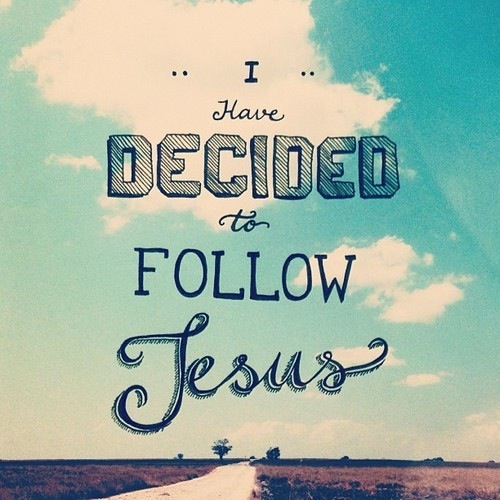 God called us to follow Him and no none else. Thanks for sharing the Word of God with simplicity and clarity. Just as you say, we ought not to be following Paul, or Apollos, or Cephas, (or Sam or Sarah), but only Christ!